So I have picky kids when it comes to onions. The girls like the idea of onions; meaning that they like the flavor that onions add to certain foods, but if they bite into a piece of onion then it’s game over. They won’t eat another bite for fear of getting another piece of onion. Any my son is just now starting to branch out beyond the realm of chicken nuggets and mac & cheese, so if he can see pieces of onions he won’t even allow the dish to appear on his plate. To combat this I got creative. Ok, sneaky. Same thing sometimes. Anyway, I grated the onion when I started playing with this recipe and it worked perfectly! Even I prefer it that way and I LOVE onions! So now I grate the onions on the small holes of the grater every time. 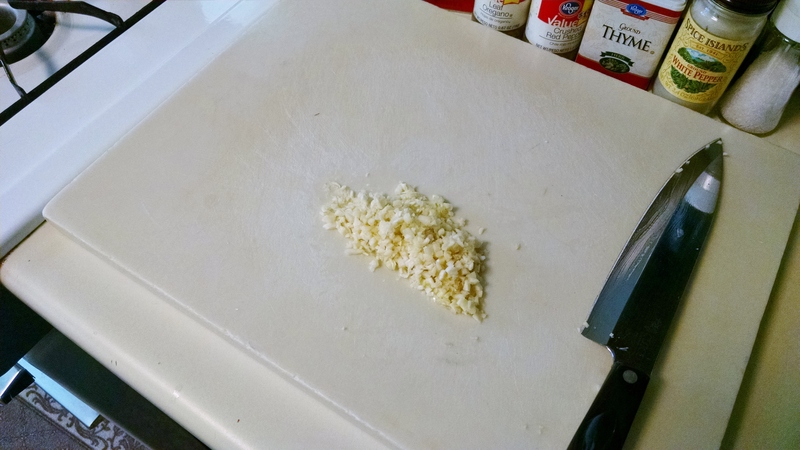 When you grate the onions, do it on a plate or over a bowl to catch the juice as well as the pulp. Now mince your garlic. You do not need a garlic gadget! Use your chef’s knife and hone your skill with it. Super easy! And it only takes a couple of minutes. Now that those two things are done, all you have left is opening a can and measuring herbs and spices. How much easier can homemade get?! You do have to make a choice, though. 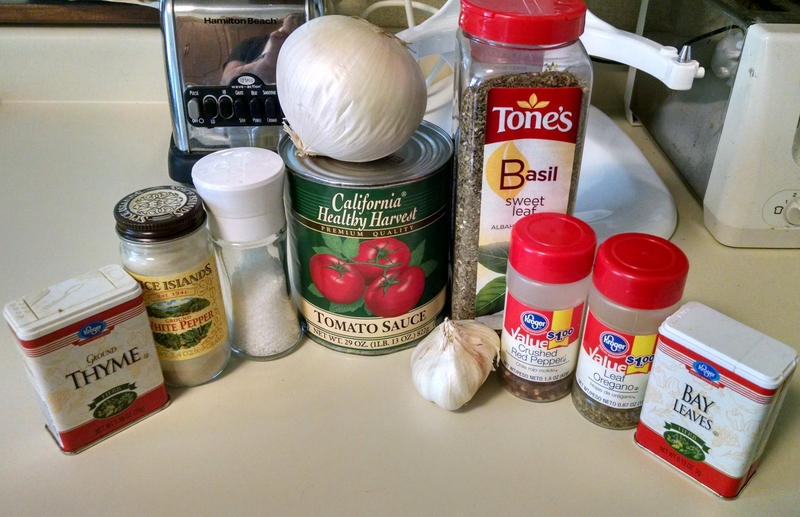 You can use olive oil for this sauce and it will turn out amazing. 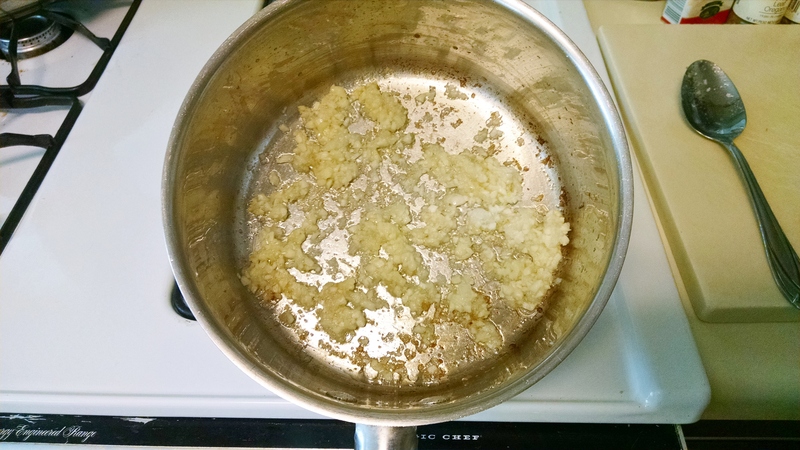 But I use bacon fat to saute the onion and garlic and the slightly smoky flavor it imparts makes the sauce stellar. I recommend using bacon fat, but the choice is yours. So choose one or the other and put it into a large saucepan over medium heat. Saute the onion first, adding the juice as well. It may sizzle a bit, so be careful. Once the onion is beginning to turn golden, add in the garlic. Let the veggies cook for another 2 minutes, making sure the garlic doesn’t begin to burn. Give it a stir every 20-30 seconds to prevent burning. The picture above is as dark as you want it to be; much darker and the garlic will turn bitter and ruin the sauce. Go ahead and add the tomato sauce and mix well. Add the brown sugar (sadly not pictured above), basil, oregano, thyme, white pepper, the smaller amount of salt, and the bay leaf into the pot. SO much flavor going into this sauce! Give this a good stir to distribute the herbs, cover the pot, and bring the sauce to a boil. Back the heat down to a slow simmer and set a timer for 30 minutes. If you think of it, you can come back and give the sauce a stir. But even if you don’t stir it at all in that 30 minutes, the sauce will be fine. This is one of those wonderful times that you can set a timer and just let the sauce do it’s own thing while you go do yours. Assuming your sauce is the proper consistency, go ahead and give it a taste. Add more salt if you think the sauce needs it (I almost always do) and the red chili flakes if you want to use them. 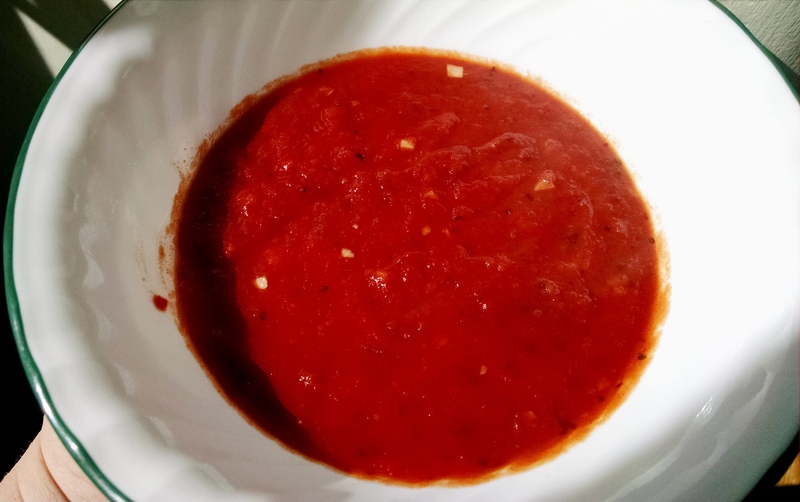 Remember that if you do use red chili flakes, let the sauce sit for a couple of minutes after you add them for them to take effect then give it another taste and readjust the seasoning if needed. 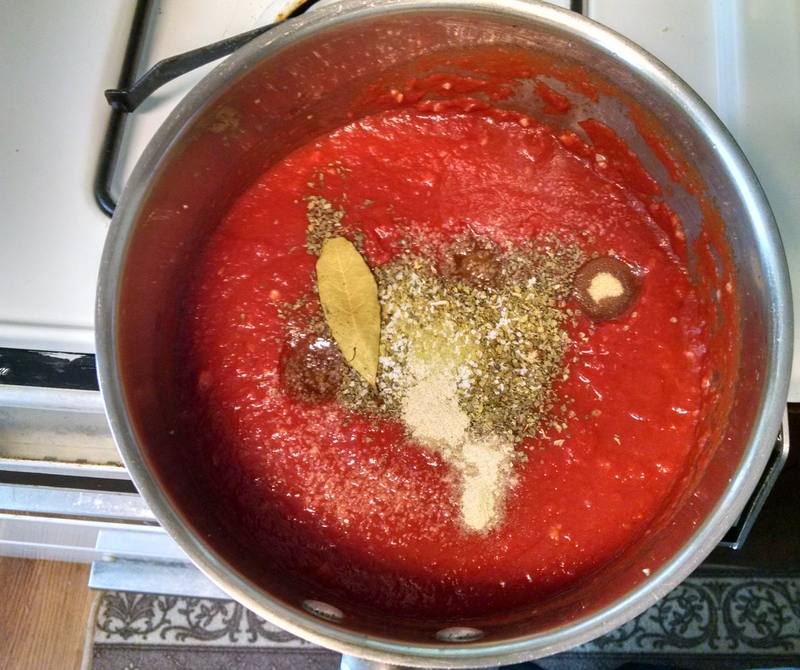 If you want a spicy, arribiata type of sauce, go ahead and add the red chili flakes at the beginning with the herbs. But be warned: it will be SPICY! We like a little kick but still want to be able to feel our lips when we’re done eating, so I add just a little and only at the end. 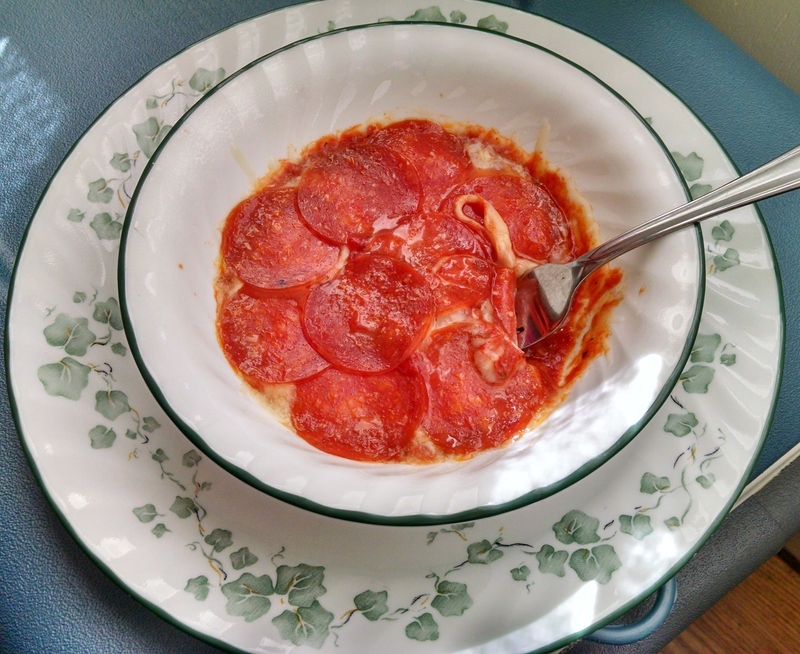 I make crustless pizza in a bowl. Stay with me on this! 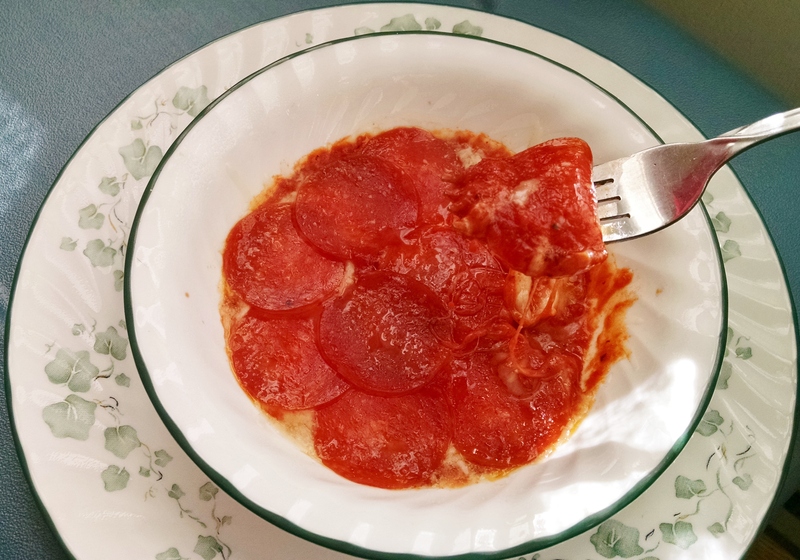 Put about half an inch of sauce in the bottom of a microwave or oven safe bowl then put some shredded or cubed mozzarella cheese in the sauce. Cover the bowl and heat it until the edges of the sauce are bubbly. Then add a few pizza toppings evenly over the surface. You don’t want to add a ton or the sauce won’t heat through well- just like real pizza. Cover the bowl again and heat until everything is good and hot. In all honesty, this is one of my favorite meals if I’m making something just for myself. But ONLY if I’m using this sauce. It’s just that good. *Grate the onion (on the smaller holes) onto a plate or into a bowl to save the juice as well. *Add the bacon fat or oil into a large sauce pan over medium heat. *Once the pan is ready, saute the grated onion (with its juice) until it begins to turn golden brown. *Add the garlic to the pot and saute for about 2 minutes, stirring often to prevent burning. *Pour the tomato sauce into the pot and stir to incorporate the veggies. *Add the brown sugar, basil, oregano, thyme, salt, pepper, and bay leaf. Stir well. *Cover the pot and bring the sauce to a boil. Back the heat down to a slow simmer and leave the sauce to cook for 30 minutes. You could give the pot a stir a couple of times if you think about it. *Once 30 minutes is up stir and check for proper consistency. If the sauce is too watery let it simmer uncovered until the right thickness is reached. *Add the red chili flakes if you’re using them, more brown sugar, salt, and/or pepper to taste. 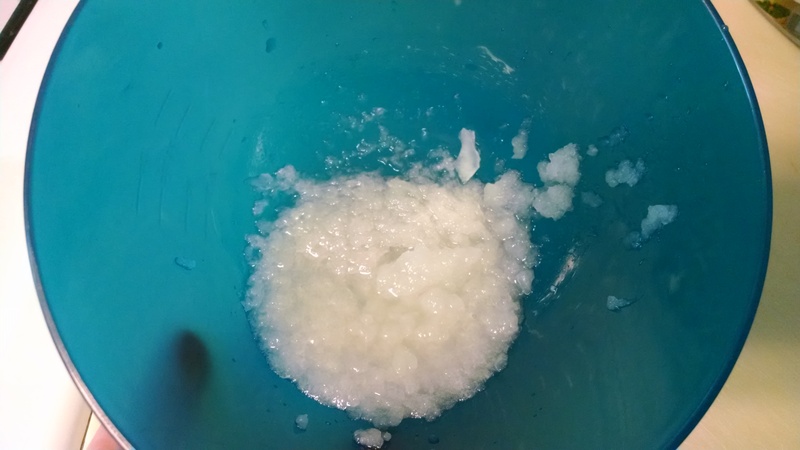 *Use as desired immediately, can, freeze, or store in the refrigerator for about a week. Yes; you read that right: Maple Syrup Dumplings. 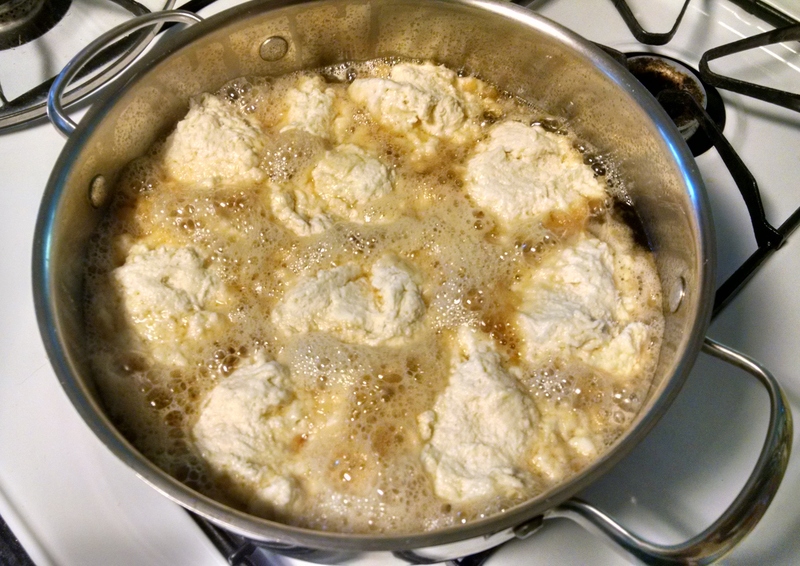 As in soft, pillowy biscuit-style dumplings in a smooth sauce of maple syrup. Because sometimes it’s SO HARD to get out of bed with all of the not-so-great stuff you may have going on in life and you just need something indulgent and comforting for breakfast. Or because sometimes you get tired of the same old rotation at breakfast time and you need something easy but NEW to get your day started right. I would fall in the camp of the former. Right now things are just not as awesome as they should be. And while things are, in fact, improving, there are days that I have to argue with myself to get out of bed and take care of business. Those are the mornings that I try to make something fun for breakfast that will be a pleasant respite from “stuff” for my family and I. 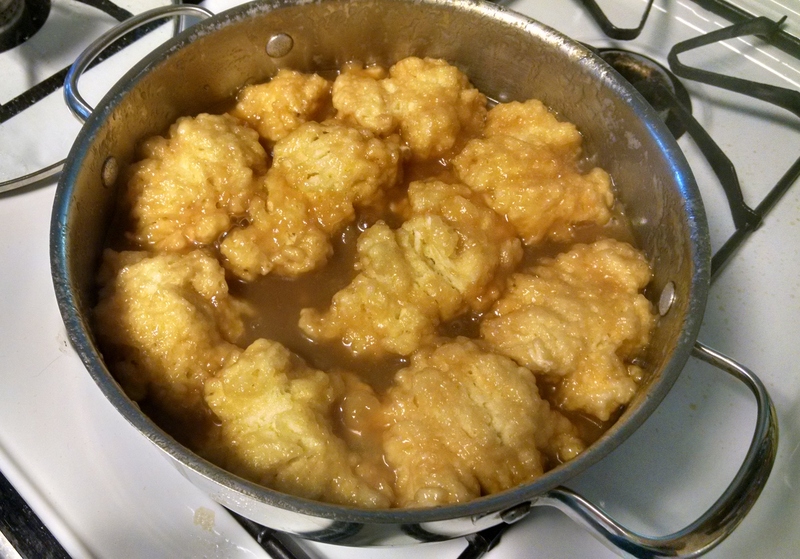 Maple syrup dumplings definitely qualify as fun! 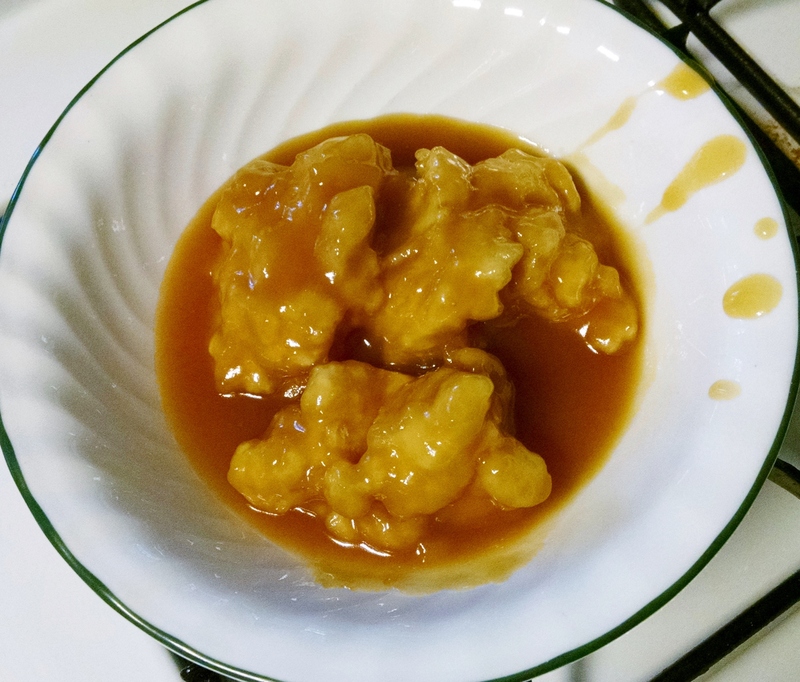 When I was first told about maple syrup dumplings, I had the same reaction I imagine you’re having: “Wow- that has to be so sweet it will make my teeth ache!” But once I actually found a recipe and made it, I found out that it really isn’t as sickeningly sweet as it sounds. See, the sauce is made not only with maple syrup but water as well. So while it’s not something that you should eat all the time, it’s definitely worthy of an occasional spot on your breakfast table! 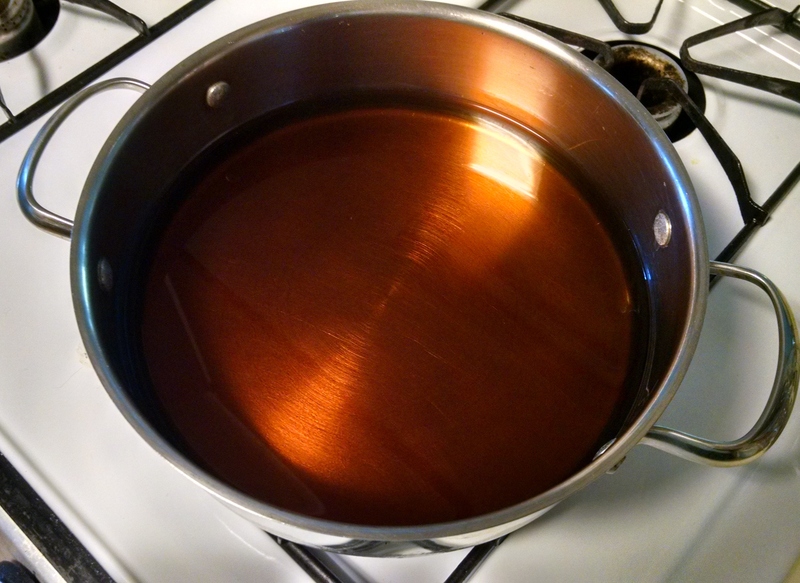 Set this aside for a minute and mix the maple syrup with the water in a large pan. If you don’t have a saucier like I do, use as big a sauce pan as you have or a soup pot. You could also use a very large skillet so long as you can cover it. One of key parts of this dish is having a tight fitting lid to make sure the dumplings cook through properly. By now your sauce should be boiling. Drop the dough by the spoonful into the sauce. I try to get dough balls that are about the size of a golf ball, maybe a tiny bit bigger. Things will calm down and the sauce won’t be bubbling as high. That’s when you need to back the heat down a little bit- but keep the pan at least at a fast simmer. When the 10 minutes are up take off the lid and check the dumplings. See the dumpling in the lower part of the middle? I used a spoon to open it up a little and make sure it was cooked through. It should look like a biscuit inside with no raw dough. And the sauce… Oh, the sauce! 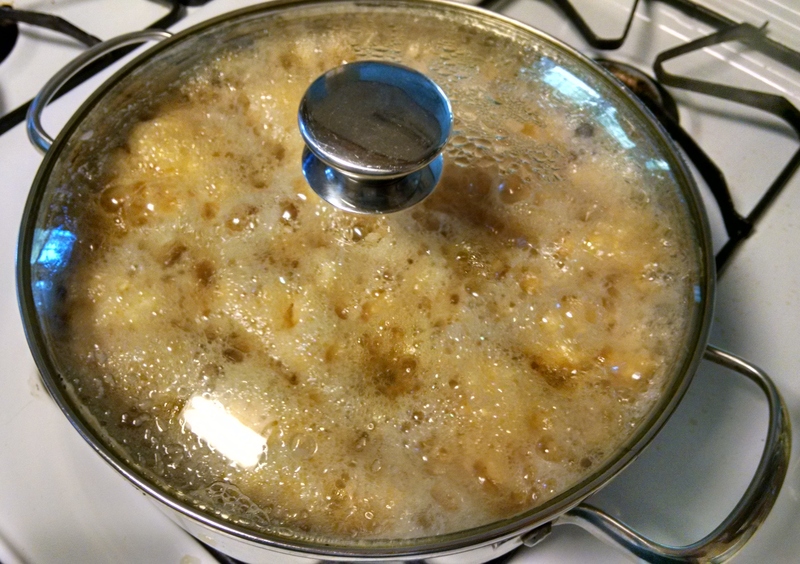 *In a large pot or pan/skillet with high sides, combine the maple syrup and the water. Set the burner to medium high. 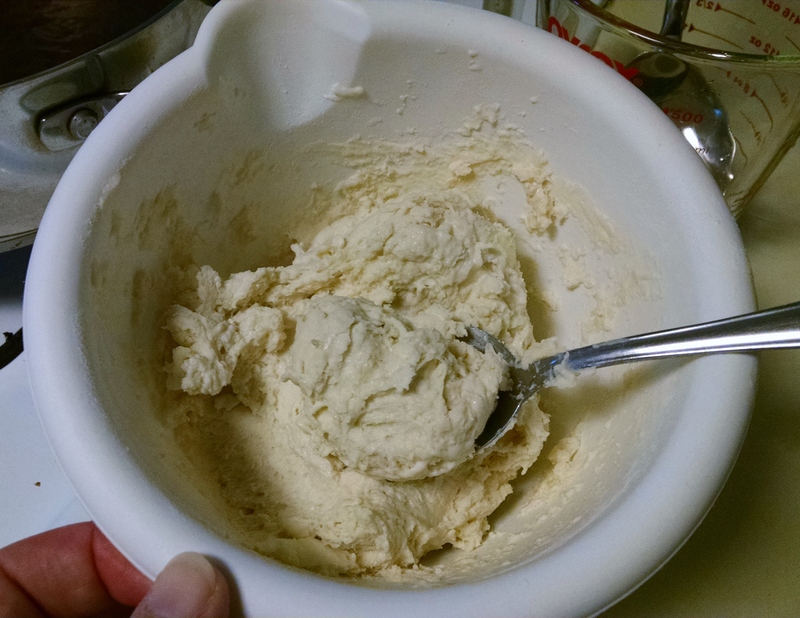 *In a small bowl, combine the flour, baking powder, and the salt. Add the grated butter and stir until the mixture resembles coarse crumbs. 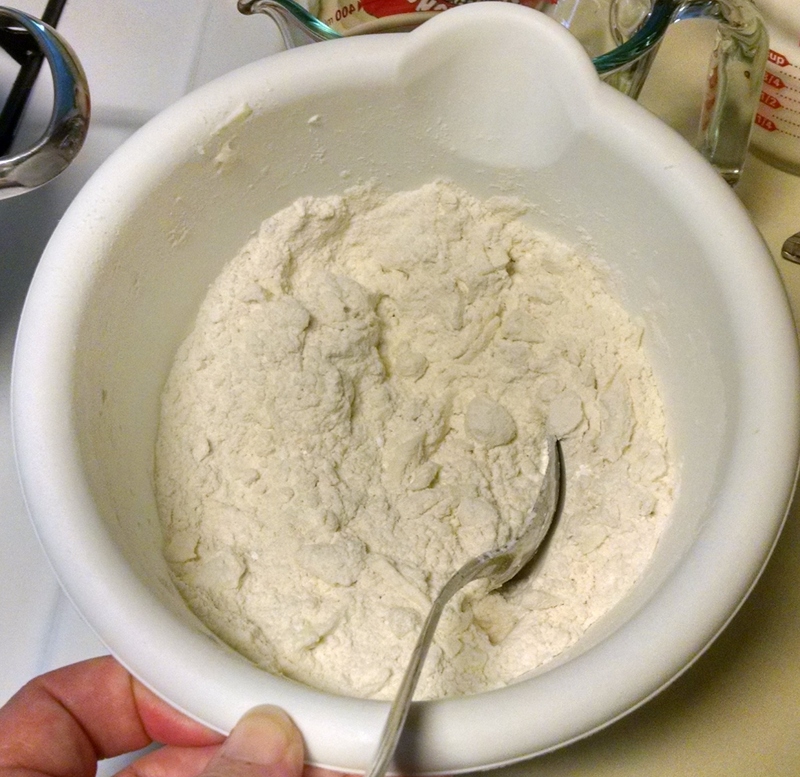 *Add the milk to the flour & butter mixture and stir until the milk is worked through and there is no more flour in the bottom of the bowl. The dough will be fairly stiff. 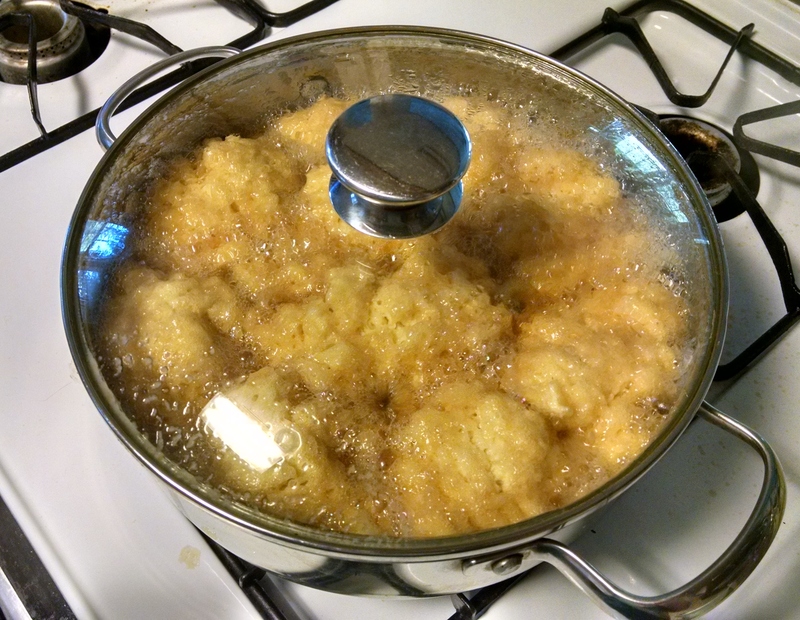 *Once the syrup mixture is boiling gently add the dumpling dough by the spoonful, making the dumplings just slightly larger than a golf ball (or about the size of an egg). *Once all of the dough has been used, cover the pan with a tight fitting lid, lower the heat to medium so that the syrup continues boiling gently, and set a timer for 10 minutes. *Once 10 minutes have passed, take the lid off and check the dumplings. They should be firm and there shouldn’t be any sticky dough left in the center. *Serve immediately, storing any leftovers in the fridge. So here we are in one of the coldest parts of the country, and we moved here willingly- happily even. Believe it or not, we wanted to move to northern Wisconsin. When my husband got his job with the railroad and it became very clear that staying in Colorado wasn’t going to be an option, we started very seriously researching places to live. And when we realized that we didn’t like South Dakota as much as we thought we would, we started taking trips to places we thought we would like. Turns out, northern Wisconsin just immediately felt like home. Some have called us crazy; “I mean, the winters there are awful!” they would exclaim. This is true. But they aren’t a whole lot worse than eastern South Dakota. And from what we’ve experienced in the last 2 months, the rest of the year more than makes up for the winters. First, I want to take a minute to talk about the cereal itself. I use Bob’s Red Mill farina (also called creamy wheat on the package). I do like that it’s organic but, more than that, I like the finer texture of the finished cereal as opposed to the slightly coarser finish of brand name Cream of Wheat. I can also buy the Bob’s Red Mill cheaper on Amazon than I can buy the Cream of Wheat at the store (because we have Amazon Prime so our shipping is free), so that’s what I use. You can, of course, use whichever you like. Just make sure to follow the preparation directions carefully, because if you don’t you’ll end up with a lumpy mess. Also, I cook mine with one part milk and 3 parts water to give the cereal a little more flavor and a little extra creaminess. You can use whatever ratio you prefer. So without further ado, let’s get down to the tastiness! How about pumpkin pie for breakfast?? 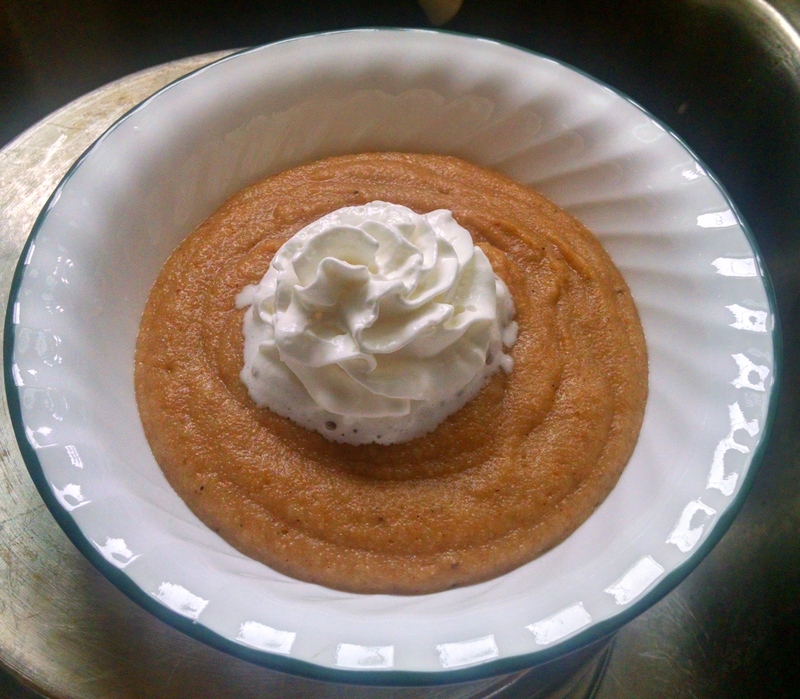 Well… I actually do serve pumpkin pie for breakfast on occasion. But if that’s not your thing, try this on for size! Make your normal batch of farina and add pumpkin, cinnamon, ginger, nutmeg, and brown sugar. Throw some whipped cream on top and you’ve got a bowl of pumpkin pie for breakfast that will fill you up and start your day with a smile! Or how about a cinnamon roll for breakfast that won’t leave you hungry 20 minutes later? It’s super easy to make cinnamon roll farina! To your batch of finished cereal add cream cheese, brown sugar, vanilla, and cinnamon. That’s it! 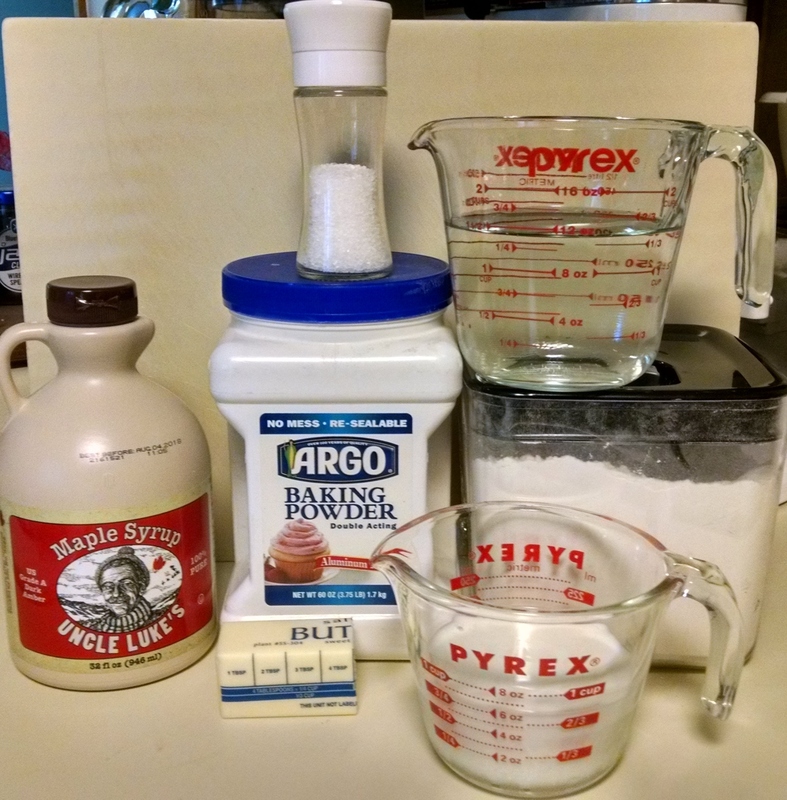 You can make an easy powdered sugar glaze to swirl over the top by adding a little milk to powdered sugar; that’s all glaze is. Or if you have some cream cheese frosting left over from something (like I did from my carrot cake), you can add a dollop to your bowl. This is my favorite way to eat farina! Ok, so if cinnamon roll is my all time favorite farina flavor, this one is a close second. Two words: BANANA BREAD. Seriously! 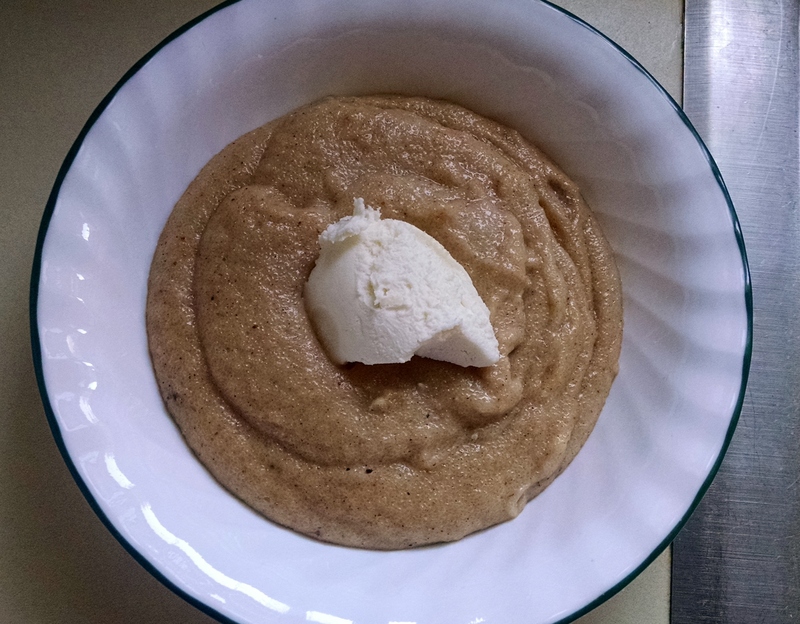 Banana bread hot cereal! I wouldn’t joke about something like this. 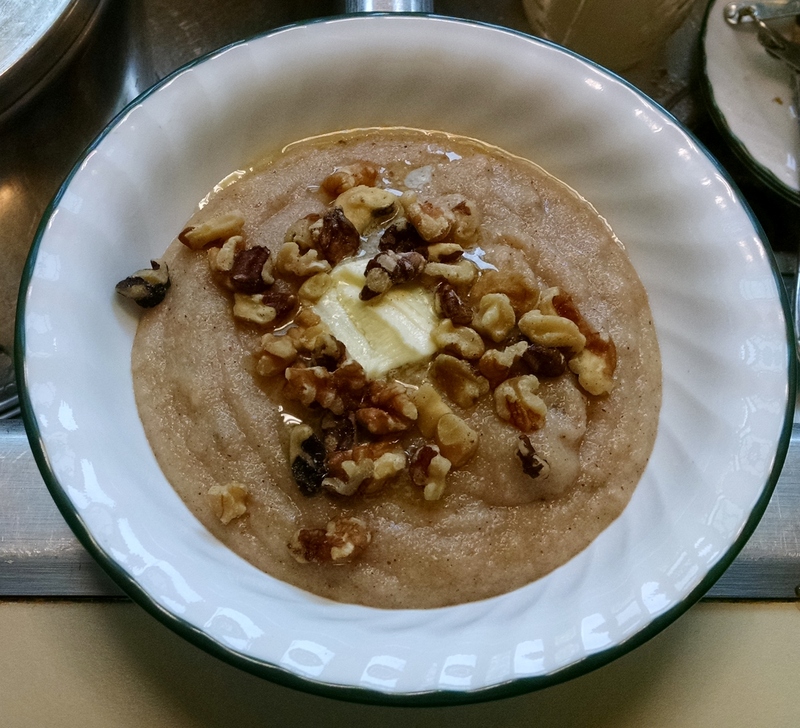 Add mashed banana, cinnamon, nutmeg, some walnuts, and a little butter and you’ve got a bowl of warm banana bread. So comforting on a cold morning! And here’s my kids’ favorite way to eat farina: french toast! This one was thought up when the kids and I were discussing all the different things one could do with farina. The thought struck me and after a couple of minutes I had a basic idea for the how to. I tried it a few weeks later and it was awesome. 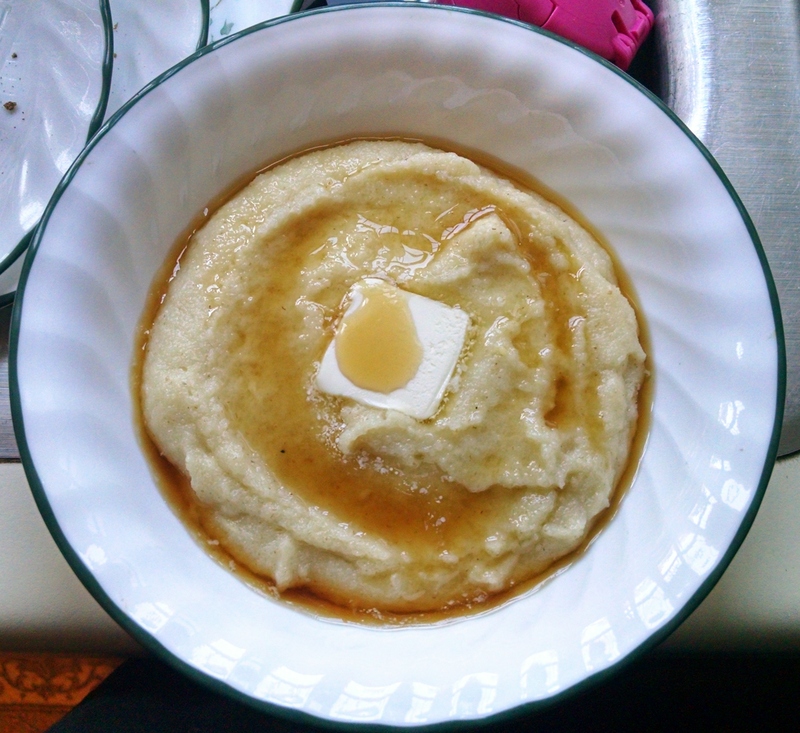 All it takes is adding sugar, vanilla, maple syrup, and eggs to the hot farina. You do have to temper the eggs first, though, or you’ll end up with scrambled egg farina and that’s just yucky. I’ll add those instructions below. Add a pat of butter and an extra drizzle of maple syrup and you’ve got a bowl of french toast tastiness. This is such a fun way to serve this old fashioned cereal! Mmmmm…. those are some super awesome bowls of comforting yumminess!! And get this: you can make a big batch and reheat it as you need it! That’s right; you can make a double or triple batch and warm it up throughout the week. All you need to do is add a little milk as you microwave it to get it back to the desired consistency. That makes it an even better weekday breakfast! So go ahead and embrace an old fashioned classic; your stomach will thank you on the cold mornings to come! *To temper the eggs before adding to the cereal: Beat the eggs in a small bowl then add about 1/4 C of the fully cooked hot cereal a little at a time while stirring the eggs constantly. Once that’s done, you can put the egg mixture back into the pot and stir it in. *Heat the pot of cereal to a simmer once again to ensure that the eggs are cooked through. *Add the rest of the ingredients and stir well.